Iana Dreyer is a trade expert and the editor of Borderlex. Hopes that the three year-old negotiations between the EU and Japan towards a free trade agreement could be finalised by the end of this year are fading. 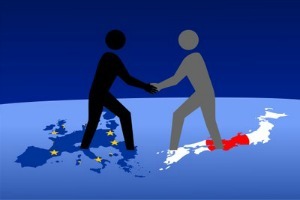 Tokyo is now in a new bargaining position, making it harder for the EU to get its way. Politicians often don’t know what they are talking about. We know this for many areas of life and the economy. This reality also holds for trade agreements. The EU is a specialist in having elected national leaders telling Brussels to finalise TTIP talks by end of 2014, then 2015, then 2016, while at the same time expecting ‘ambitious’ outcomes that involve time and patience… A similar process is visible in the EU Japan negotiations. Well, the Commission – more technocratic, less (though increasingly) political – is saying it now. On Monday, Mauro Petriccione, the EU Commission’s lead negotiator of the EU Japan free trade agreement, said it clearly: “The 2015 target will not be met“. Full stop. Nonetheless, the talks have advanced rapidly in recent months. Negotiation rounds are being held monthly, instead of every two months until this summer. In fact, negotiators are only catching up with lost time. Since 2013, Japan has been negotiating its participation in the recently concluded TPP with the US and other Asia-Pacific nations. That absorbed Japanese trade negotiator’s time, and in particular Shinzo Abe’s administration’s domestic political capital as TPP involvled facing down the country’s über-protectionist agricultural lobby, a key supporter of Mr Abe’s party. Many Europeans have hoped that now that TPP is closed, the Japanese would be ready to talk to the EU and rapidly seal a deal. Hell no. Japan is now basically asking Europeans to sign on to a deal that offers similar terms Japan offered to the United States and others in TPP. The only problem is that signing on to Japanese TPP terms means some fundamental EU interests would have to be forsaken: some non-trade barriers of particular interest to the EU, public procurement, geographical indications, mobility for professionals, and some import tariffs on porkmeat or cereal products. Will the Japanese move? One cannot avoid the impression that negotiators in Tokyo are relishing the new bargaining power they have gained over the EU. The negotiations, which they called for initially, started in a very humiliating way for them: the Council asked that Tokyo first prove its good intentions by accepting to remove some technical trade barriers and that negotiations would be stopped after one year if they didn’t. That’s not the way you treat an equal, is it? Especially if that partner really only wants one thing from you: that you eliminate import tariffs on cars and some electronic goods – the rest didn’t really matter for Japan at first. After that the EU made some absurd requests, such as asking privatised Japanese railway firms to continue to abide by international government procurement rules. Now it’s the Japanese turn to put pressure on the EU. The EU now wants a public international investment court instead of investment arbitration? Well. That will have to wait. The Japanese Ambassador to the EU, Keiichi Katakami, told Borderlex on Monday that an EU-style permanent court would take years to negotiate. In his view the TPP’s investment chapter contains excellent guarantees for a state’s right to regulate – a key concern for ISDS critics. What is more “We are for ISDS”, Katakami said. The Japanese recently decided they liked the idea of regulatory cooperation on standardisation issues – à la TTIP. Europeans are not keen on including that in the FTA negotiations. But the Japanese are pressing the EU to get started as soon as possible on a parallel process, and they are clearly using this as a lever in the FTA talks. Under these new conditions, don’t expect an EU Japan FTA to materialise soon.